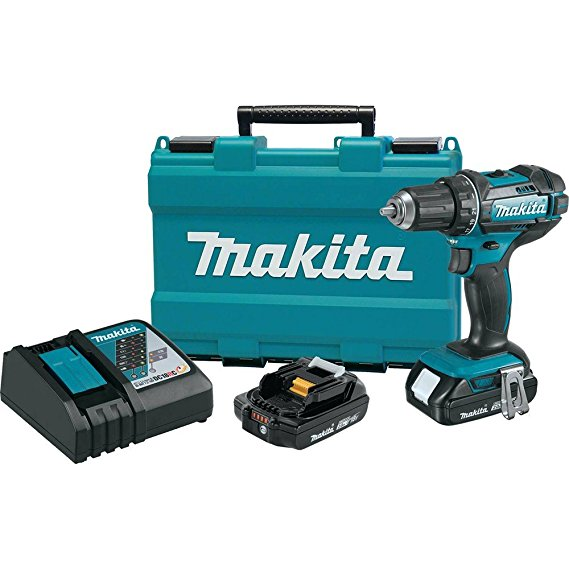 Makita XFD10R is deigned to give superior performance,power in a small size. Its battery can be charged fast and has a very low downtime. The motor can deliver 480 in lbs of Max torque and has a two speed transmission settings of 0 to 600 and 0 to 1900 RPM. its very compact and lightweight. it also has the built in LED which helps in illuminating the work area. Its economical design gives more balance and comfort. It has improved water and dust resistance due to Extreme Protection Technology. One of the best cordless drill and Overall highly recommended. Battery can be recharged in 30 minutes. Very lightweight, only 3.3 pounds. Mechanical 2-speed transmission (0-600 & 0-1,900 RPM). Dual L.E.D. lights with afterglow. Less power – 480 inch-pounds of torque. Warranty of 1 year only. Q – When this cordless drill is not in use, will the battery drain at that time? A – Answer is no, The battery is of lithium, which have a long shelf life. You can keep it idle for several months. Q – Can you tell me about the extra compartments in this case? A – Battery compartment can hold big battery, Other compartments are made to be used to keep your other stuffs. Q – So do we get a drill, 3.0Ah batteries and a charger with it? A – You will get a Power Drill, Two batteries, and a charger. These batteries can give power for very long time and also charging time is very small. Q – Charger is of 110V or 220V? A – It is of 110V.